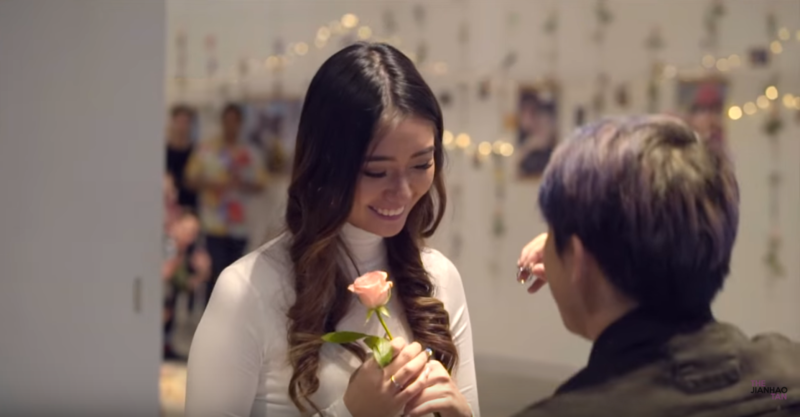 It’s no surprise that the top vlogger in Singapore, Jianhao Tan, made quite an effort to create a wonderful experience for his girl friend, Debbie, when he proposed to her recently. In a YouTube video, uploaded on March 17, Jianhao shows his viewers how the whole event was conceptualized from start to finish, and everyone who helped him along the way, including his own team, other influencers, and even a big international brand! In Jianhao’s video, you can see him deciding exactly what he wants to do for the proposal, and asks his team to help him. He also brainstorms with his friends and other influencers, enlisting YouTube stars like Dee Kosh to fulfill the requirements to make it a huge surprise, which would include fooling Debbie into thinking she was attending an actual event. The video also featured the ring he had chosen for her, and Miaja Gallery, the venue that was able to accommodate his needs, with one part of the gallery set up for a fake Skechers x One Piece event. The ring came with this really nice box. Prior to the event, Jianhao had invited all his friends, his family and Debbie’s family as well, along with a childhood friend of his from Vietnam, who flew in to conduct the string quartet. he also higlighted that he wanted their dogs, especially his 16-year-old canine friend to attend the proposal to make the whole event really memorable. Sure, cast disparaging views on people who follow YouTubers but ow you follow online forums is completely different, right? It’s 2019, in case you forgot. Also, if this is how Jianhao is “pressured,” we sure would like to see what he does when he just wnts to do something because he likes it. We’re sorry no one has ever made the effort to surprise you with something nice in all your life..
We’re sure things may have been easy for Jianhao at some point, it wasn’t always easy. Congratulations to Debbie and Jianhao on their impending nuptials! Don’t let the haters get to you! Read about Naomi Neo’s engagement party here. Previous[Movie Review] The Kid Who Would Be King – Wholesome and Entertaining, but Tanked at the Box Office?